For a while, Grey's Anatomy had built in a contingency plan. If star Ellen Pompeo ever wanted to hang up the scrubs and walk away from the series' namesake character, Meredith Grey, Shonda Rhimes had given ABC some options. In season three, we met Mer's half-sister Lexie Grey, who Chyler Leigh played until her death in the brutal season eight finale plane crash. But before she died, she was the other Grey in the mix who could keep the title of the show accurate, should Pompeo tire out. And in the season 10 finale, she went back to the well with the introduction of Kelly McCreary's Maggie Pierce, who turned out to be the love-child of Mer's mom Ellis and Dr. Webber (James Pickens Jr.). It wasn't as neat a possible replacement as Lexie, what with the different last name, but it was a possibility nonetheless. However, as the show nears its landmark 300th episode, airing Thursday, Nov. 9, Rhimes and the cast of the ABC series are admitting what fans have known all along: There is no Grey's Anatomy without Ellen Pompeo. "Ellen and I have a pact that I'm going to do the show as long as she's going to do the show," Rhimes admitted to E! News' Sibley Scoles at the show's big celebration over the weekend in Los Angeles. "So the show will exist as long as both of us want to do it. If she wants to stop, we're stopping. So I don't know if we'll see 600, but I want to keep it feeling fresh. As long as there are fresh stories to tell and as long as we're both excited about the stories being told, we're in. So, we'll see where that takes us." Star Sarah Drew said it a little more plainly: "Oh, we can't do the show without Ellen. It's not Grey's Anatomy." "She's incredible. She's been the lifeblood of this show, her and Shonda, from the very, very beginning," Caterina Scorsone added. "They've watched the culture change together. So, I don't know man...I feel like no matter what, even if she was there or wasn't there, she's always going to be there." As star Jason George, who's about to hop ship for the still-untitled midseason spinoff, gushed, the show simply wouldn't have ever gotten this far without Pompeo and Rhimes. "Without Shonda and Ellen, I don't know if we make 100, 200," he said. "Look, every team needs a phenomenal coach and you need a great quarterback, you know what I mean? Ours happen to be that phenomenal woman over there, and that one over there." "This is a real testament to Shonda Rhimes' brilliance. 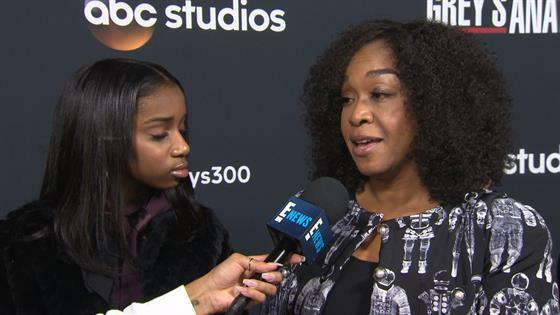 Shonda Rhimes laid it down, honey," directing producer and recurring guest star Debbie Allen said of show's prolific creator. "She put it down and this is home plate for everything else that's coming. We are the litmus test for probably every show she has done and will do, and I would say her new name is Kahlessi. The real Kahlessi is a black woman with more than three dragons." And she was equally effusive about Pompeo: "You're asking me about someone that is really special to me. I just really adore her, I respect her. I talked her into directing an episode last year, and I could see that nurturing quality in her and also the creativity. So after 14 years, for her to still be excited about what she's doing, to be so invested in every episode and every character, that makes everybody get on the good foot, honey." For more from the cast on on Pompeo and Rhimes' imprint on the series, be sure to check out the video above! And for more on all things Grey's Anatomy in the lead up to the big 3-0-0, check back with E! News all week! Now it's your turn. Could you imagine Grey's without Meredith? Or is it too sacrilegious for you to even consider? Sound off in the comments below!